Business memorandum or memoranda — also called memo or memos — are specially formatted written communications within your business. 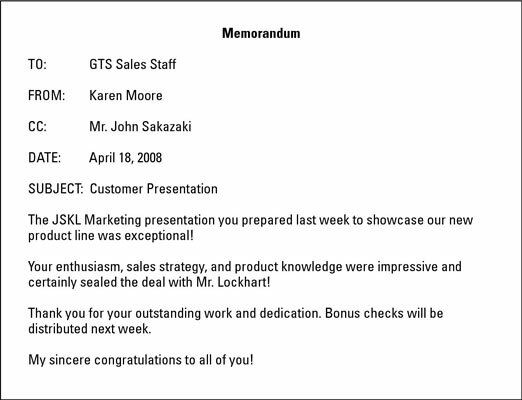 A memo’s format is typically informal (but still all-business) and public. Memos typically make announcements, discuss procedures, report on company activities, and disseminate employee information. If you have something confidential to communicate, don’t do it in a memo. The tone of memos usually is informal and friendly. Although you don’t need to be curt, officious, or patronizing, a certain succinctness is acceptable. Structure the memo so that the most important information comes in the first paragraph and that subsequent paragraphs spell out what’s discussed in the first paragraph. Use suitable paper for your memos — white bond, either note size or standard to fit most desk in-baskets. Some people appear to think that memos, because they’re public, are effective management tools. Although memos are effective for direction and suggestion, criticism and praise are best given in person. Even though the majority of information today is conveyed via e-mail, you still need to use the correct style when sending a memo in the body of an e-mail. When you’re conveying larger amounts of information, send that information as a properly formatted memo attachment. The message itself can contain the correct headings, numbered items, and other formatted information that an e-mail does not allow as easily.